ETRA, the European Twowheel Retailers’ Association, has reported on eCall, a European wide IT system being proposed by the European Commission that would be activated automatically when in-vehicle sensors detect a serious crash. The EU Commission would like to make the system mandatory for all vehicles and to have eCall in place by 2015 on automobiles (cars) and light duty vehicles. .
Once set off, the system dials the European emergency number 112, establishing a telephone link with the emergency centre, thereby sending details such as time of incident, accurate position and travel direction (most important on motorways and in tunnels). With their complex dynamics Powered Two-Wheelers pose some challenges for an efficient eCall functionality. Due to the likelihood of PTW-rider separation in an accident, other options of eCall triggering must be investigated – for example by integrating sensors in helmets and/or clothing of the rider. As communication between the rider and the rescue service is necessary, eCall functionality could be linked to the rider, not the vehicle. Should the eCall system be distributed between the PTW and the rider (helmet, clothing, etc), the issue of the system’s communication range would need to be solved. The issue of cost needs also to be addressed when discussing eCall for PTWs. Consumer acceptance is of extreme importance. The additional cost of an eCall may be disproportionate for the price range of certain products, an important challenge for the industry needing to find cost efficient solutions. At Right To Ride we responded to the European Commission’s public consultation in September 2010. The rationale behind eCall is that, according to the EU Commission, it will save around 2,500 lives per year throughout Europe, however a study carried out on behalf of the Department for Transport in GB, highlights that, “many experts believe the evidence for this reduction of 2,500 deaths is slim.” The main study looked at accidents in Finland to estimate the reduction in casualties, which largely occur on isolated roads with no witnesses. 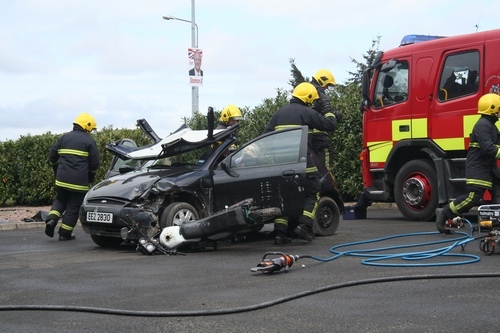 By contrast, almost all accidents in the UK are quickly reported to the emergency services. The report concluded that the benefits for the UK are outweighed by the costs, which are estimated at £2.2 billion between 2010 and 2020. The cost for motorcyclists would remain the same whether mandatory or voluntary eCall will cost approximately 100 euros for installation, the installation would most likely be in helmets. More relevant is the fact that once the criteria for eCall are established, the system will become a lucrative market for its stakeholders within the automotive industry, the mobile telecommunications industry and insurance companies. To improve road safety, research on innovations in the field of communication technologies must continue. The European Commission took the first steps to ensure life-saving emergency call systems for road accidents would be in place by 2015 on automobiles and light duty vehicles. Member States and mobile phone network operators were involved in the deployment of eCall, believing that these devices can reduce the time emergency services need to arrive at road accidents. Improving road safety is among the policy priorities of ACEM members. Motorcycle manufacturers are researching innovative systems that promise to benefit the safety of riders, eCall being among them. eCall is activated automatically when in-vehicle sensors detect a serious crash. Once set off, the system dials the European emergency number 112, establishing a telephone link with the emergency centre thereby sending details such as time of incident, accurate position and travel direction (most important on motorways and in tunnels). An eCall can also be triggered manually, for example by a witness. These principles however have been developed for cars. With their complex dynamics Powered Two-Wheelers pose some challenges for an efficient eCall functionality. Triggering based only on the impact undergone by the motorcycle is not sufficient as it does not necessarily imply that the same impact was experienced by the rider. For example, a motorcycle simply falling over would faultily trigger the emergency call. Moreover, in the case of an accident the consequences on the PTW and on its rider may vary, again not requiring any rescue. There is therefore still the need to establish which accident configuration should trigger an eCall to avoid false alarms to Public Safety Answering Points (PSAP). Unlike in the car drivers, motorcycle riders and pillion riders are usually separated from the vehicle, in case of an accident. To successfully complete the rescue it is important to gather reliable information as to the position of rider and passenger, as opposed to just the position of the motorcycle. What matters is communication between the rescue team and the rider, not the vehicle, raising the issue of where the eCall device should be placed. Solutions could come from helmet and clothing manufacturers, who would have to be involved in the discussions. Hardware components for PTW-specific eCall differ greatly from those designed for cars. The reduced size of motorcycles, the absence of a passenger compartment and different PTW usages require an adapted engineering of motorcycle eCalls. On PTWs the risk of the eCall device being damaged during an accident is much higher than on passenger cars or on light duty vehicles. It is therefore very important to position all necessary components in the safest and most secure location of the vehicle. While manufacturers began research programmes aiming at finding reliable solutions, which might provide the basis for future standardization, no appropriate concepts exist yet. Third Party Service (TPS) eCall whereby the device contacts a private call centre, which determines the truthfulness of the call and transfers it to the PSAP. Responsibilities for each individual stakeholder involved in the eCall framework need to be defined in detail so that liability issues can be answered appropriately. In some cases these issues differ from the liability framework foreseen for the automobile eCall. From the point of view of the industry a full understanding among every stakeholder must be achieved before endeavouring in a large scale deployment of PTW eCalls. The Saferider project has demonstrated the technical feasibility of eCall for PTWs, but it also highlighted a multitude of serious constraints and limitations. The prototype developed within this research project is far from being ready for market deployment. The system was designed to cover a wide range of situations, with automatic and manual activation, as well as with a disabling switch in case of unintended activation. The Saferider eCall for PTWs features acoustic and visual Human Machine Interfaces. However such a complex and expensive set of solutions (eCall module + on board navigation system + Bluetooth helmet) is not appropriate for PTWs of lower price ranges as they’d negatively determine a disproportionate increase in price for the consumer. The success of the Saferider eCall lies in the fact that it started a process analysing the strategy and the vehicle-rider interaction. A solution for technical challenges and cost increases can come from smartphones. The motorcycle industry considers eCall systems to potentially have some benefit for riders, but it is still to be determined exactly how and how much PTWs would gain in terms of road safety compared to cars. • Solving all necessary liability and legal questions. The amount of unresolved issues doesn’t presently provide the necessary certainties required for making eCall available to all PTWs. The main question remains whether eCall devices will be integrated on PTWs, or if other solutions will demonstrate to be better. More research and engineering is therefore needed. At this stage it is too early to speak of the integration of eCall systems on PTWs. The Motorcyle Industry needs to develop its own motorcycle-specific eCall and acquire sufficient data before being able to proceed to the standardization phase involving other stakeholders. I have been working on how to do eCall on motorcycles. Thanks Right to Ride to make information available to all riders.